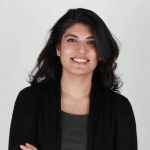 Samar Shaheryar is the Co-Founder of Baby Hero, an organic baby clothing company whose products fund innovations in maternal and infant health. Born in Pakistan and raised in the U.S., she is a former banker turned social entrepreneur. Samar currently lives in Hong Kong with her husband and three daughters. Follow her on Twitter @SamarShaheryar. Working has always energized me. As long as I had an intellectual, purposeful challenge I could work all day and into the night, as I did in my early years in finance. Outside of my day-job, I spent a considerable amount of time on causes that I was passionate about, co-founding and leading fundraising organizations concurrent to my job as a bond trader. 10 years into this life, my husband and I decided to move abroad and start a family. I stepped my foot off the gas pedal and stopped working, concentrating on getting us adjusted to life in a foreign land and growing our family. After having the first of my three children, I was ready to dive back into work, but I also knew I couldn’t go back to the corporate world – not only because I wanted flexibility to spend time with my daughter but because I wanted to put my skills to work to build and lead a company, not just work within one. I took the leap into entrepreneurship without much of a clue as to what I was getting into, but with a tremendous sense of purpose. My co-founder and I created Baby Hero, a socially responsible children’s clothing company dedicated to reducing infant mortality while maintaining an ethical supply chain. I knew nothing about baby clothes or supply chains or marketing – but I jumped into the deep-end expecting that I would learn on the job because I deeply believed in what we were doing – harnessing the power of consumers to solve one of the world’s most pressing social issues. Three years later, as we’ve built our brand, funding thousands of medical products for newborns in the developing world in the process, I’ve learned a lot about all those previously elusive topics – manufacturing, marketing, supply chains and I’ve also learned about the significance of entrepreneurship in advancing the leadership potential of women. If I had returned to banking instead of going out on my own, I wouldn’t be as fulfilled or productive as I am and I’m positive I never would have gained the leadership skills I now have. 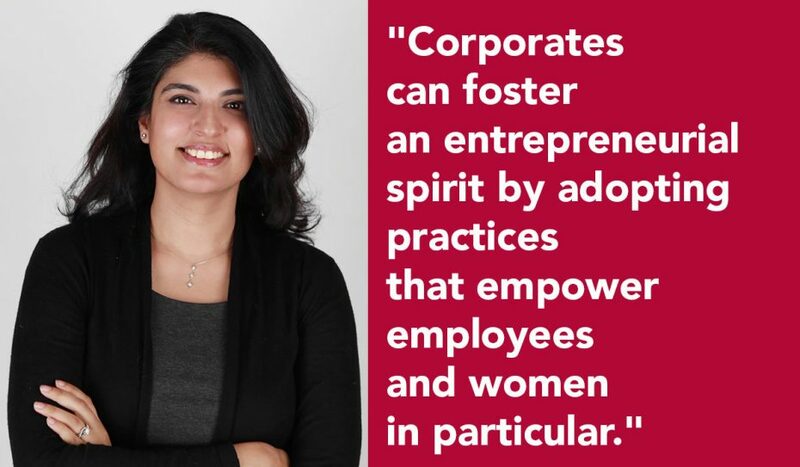 Corporates can also foster an entrepreneurial spirit by adopting similar practices that empower employees and women in particular. Responsibility for Ideas: Being a chief decision-maker for a new idea and carrying it through to fruition, is a hard and fast learning experience – the more responsibility you have, the quicker you figure out what works and what doesn’t. In most big firms the ability to run with an idea is rare – being innovative often takes multiple levels of approvals and by the time you are ready to implement an idea, there are so many other people involved that your ownership of it is gone, as is the understanding of how to refine it. Even in our small company, once we reduced the decision makers, we moved so much faster – making a decision on holiday packaging in a matter of days that had languished for over a year. Skipping the Politics: In entrepreneurial settings, the most important thing is your ideas and your work – you aren’t waiting to get to a particular position of power before being heard or concerned about stepping on toes – this leaves more time for productivity and also reduces a common frustration of work – navigating unwritten rules of work politics. Fostering an environment where everyone is enthusiastically working towards a common goal, where voices are equally respected is something that entrepreneurial companies do well. Smart research shows that this also works best when teams and their leaders are kind, friendly and open. Flexibility for Life: The world is finally waking up to the fact that both women and men are better employees when they are happy and part of that happiness comes from leading a balanced life including time with family or for hobbies. Running my own company gives me the flexibility I need – this doesn’t mean I don’t work as much – I actually work more, but I can work around the times my children need me, which is usually during the day. It also means much greater autonomy to make decisions about my time – no “face-time” needed, which allows me to assess and reassess work priorities as needed. Measured Risk-taking: The very definition of “entrepreneur” is someone who is willing to take a risk for an economic gain. There is an oft-quoted adage about the difference in risk-taking behaviour between boys and girls. “Before they jump, girls ask ‘could it hurt?’, boys ask ‘how MUCH could it hurt?’”. Of course, plenty of women ask the question usually attributed to boys – “how much could it hurt” – they are willing to jump to see where it gets them. Without that ability, great leaps forward in innovation will never happen – at the same time, we are seeing that female entrepreneurs are showing tremendous success by measures of profitability, perhaps by being measured in that risk-taking. Dreaming Beyond Experience: One of the most interesting things for me has been realizing exactly how applicable my previous experience in banking was to something completely new – the way I thought, worked and approached teamwork were essential and transferable skills. Unfortunately, in most companies, no one is going to take a chance on hiring someone for a role they have zero training or experience in. I had to found a company to learn how to run a company in a new industry. Within a corporate environment, this could just as easily be done by giving people the chance to retrain for internal roles or to rotate through roles. Especially for leadership – understanding how multiple roles and departments function is a crucial skill – one that more of us need to acquire.